Its Meli, just here to bring you some of my favorite it cosmetic products I own. Some I have had for a short time, some I have had almost a year. Each one of these products, I either love or like, there are none that I hate. But I want to start by sharing what it cosmetics is about before I post the products. It cosmetics is a makeup company that was founded by Jaime Kern Lima. This is Jaime story, directly from the ITCOSMETICS WEBSITE. ""If there is a beauty issue that troubles you, most likely I suffer from it too. I pour my heart and soul into creating innovative and effective problem-solving products that truly make you look and feel your most beautiful! As a former news anchor and a sufferer of Rosacea I wanted to have beautiful looking skin, but every product I tried (and I tried them all!) either wouldn't cover- or if it did it would crease and crack and make me look 10 years older! That is when I knew there had to be a better way! At IT Cosmetics we work with plastic surgeons to infuse cutting-edge anti-aging technology into truly innovative high performance products designed to give you your most beautiful skin ever. I am so happy, blessed and honored to have you as part of the IT Family." Jamie Kern Lima Co-Founder, IT Cosmetics®""""
Now about the Makeup itself. These products are crafted to be the safest for the skin. They work really well on sensitive and don't cause irritation from what I have seen and used. They are amazing to the touch, powder cream form, is what I would called the formulation of the powder products such as the eye shadows, bronzers, and blushes. The products are created to be healthy and safe for your skin. They all go on smooth and feel like your not wearing anything on your face. I especially love to wear, "it cosmetics" products in the summer, when I have the most irritation on my sensitive skin, due to the sun. 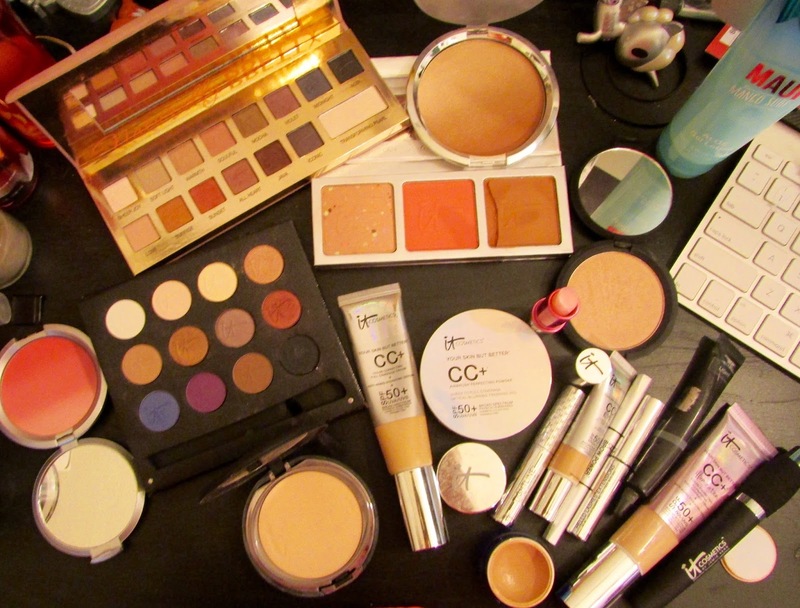 The other great thing about all it cosmetics products, is that they are made for the modern day, on the go woman. All IT products are easy to use, to blend and to work with.So they would be perfect for that female who only has five minutes for makeup before the kids come running in, or before you go running out the door. The first product, I am going to talk about is the It cosmetics "pretty eyeshadow matte palette Vol. one". I have had a love hate relationship with this product. Why, you may asked, it is because these shadows, blend so smoothly.So when blended, they can easily blend away, without even trying. They feel so amazing on the eyes, and too the touch. 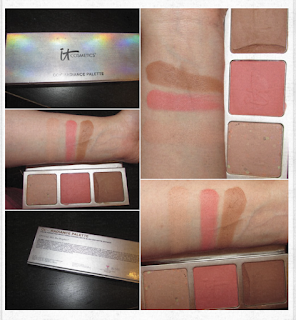 They swatch easily when testing them out. The colors are very beautiful and so perfect for everyday wear. 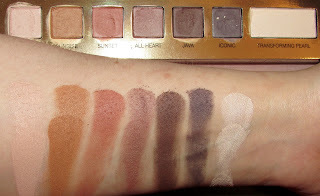 Thats the great thing about this palette is that you can use it everyday for work or home life.Also I would like to share that this palette is all mattes except the bigger shadow at the end which is pearl finish and is called the transforming shadow. I have tried to use it as a transforming shadow, but I didn't really see a change in the other shadows. So I like to use the transformer shadow as a highlight shadow for the inner corner of my eye and brow bone. 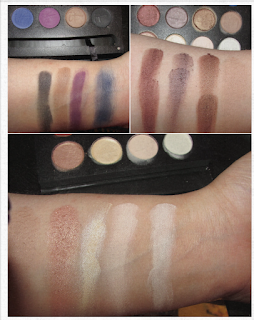 Now I want to add some information about the Pretty Palette from the "It Cosmetics" Website directly: "Formulated without talc, these shadows are designed to make your lids look younger instead of older and are formulated with lid-loving ingredients including Peptides, Collagen, Silk and Antioxidants!" I don't know any woman who wouldn't love to have healthy skin and healthy vegan, cruelty free makeup. 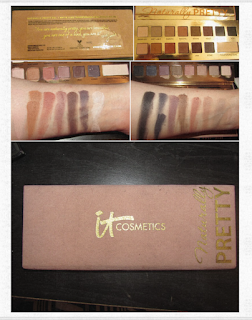 This palette is available at QVC, Ulta and It cosmetics. com. I will have all prices and links listed below at the end of the blog. The next item is my favorite eyeshadow Palette. It is the "Luxe palette" and the only It cosmetic palette, that I own, that has a mix of satin, pearl and matte finish shadows. 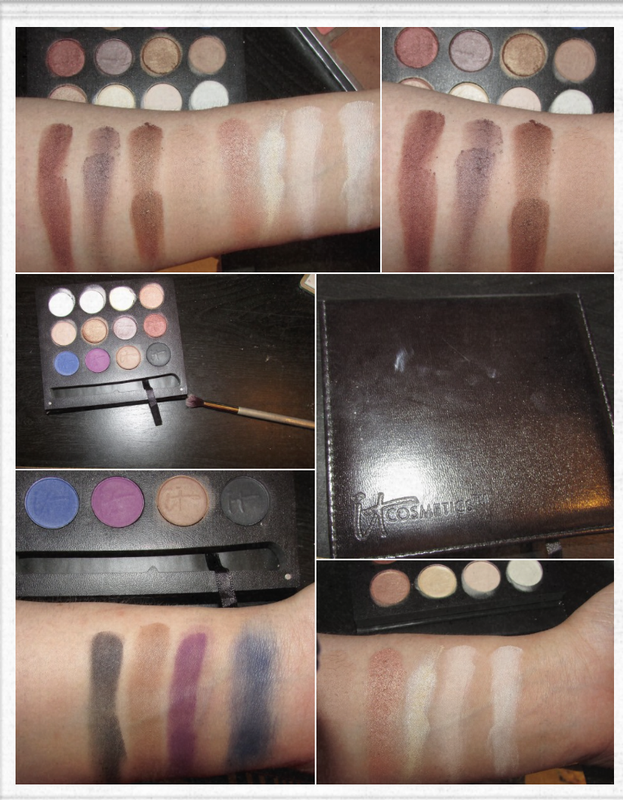 It comes in a black, padded palette which is square instead of rectangle like the Pretty Palette. The shadows are stunning, blend like a dream. They also feel like cream, each shadow does. Neither palette has hard shadows. The shadows blend in each palette like butter being put on bread. The only differences between the two palettes is that the Pretty palette can blend away while the Luxe Palette blends, but the colors stay true to themselves, and the Luxe palette has the satin and pearl type shadows while the Pretty only has one pearl shadow. 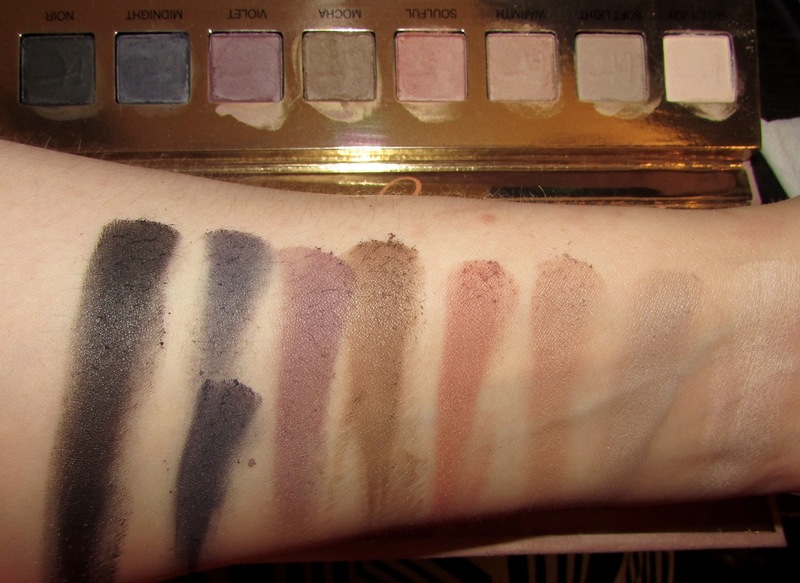 Now I will share the swatches of the Luxe Palette. I would also like to add some information from "It cosmetics" about this palette:""A gorgeous, naturally pretty, Anti-Aging powerhouse palette of 12 Talc-free, hydrating, luxe eye shadows and one dual shadow/liner brush. The Luxe High Performance Anti-Aging Eyeshadows are all about intense pigment, in a naturally pretty look. Developed with leading plastic surgeons, and using Anti-Aging, hydrating ingredients including Hydrolyzed Collagen, Acai, Green Tea, Grape Seed and Vitamins A, C, & E, these shadows help treat skin with Anti-Aging benefits and give a more youthful radiance while providing instant coverage for imperfections and beautiful naturally pretty colors. Paraben and Talc Free""
So as you can see from this information, this palette is quiet health and safe for your eyelids and skin. I love this palette for those reasons. As I have already pointed out and what you can see from the photos, is the different colors and the intensity of each color. This palette is mix of cool and warm tones while the Pretty palette was more warm tone. I love that about this palette. This palette is available at QVC, Ulta and It cosmetics. com. I will have all prices and links listed below at the end of the blog. "IT Cosmetics CC Radiance Palette"
This three item palette consist of a setting powder, or highlighter, a pretty pink blush, and finally a beautiful matte bronzer. It has the same creme to powder feel. All three items glide on the skin like a dream and mix well beautiful as your main, highlight, blush and bronzer. I could wear only this palette all the time on my skin and be incredibly happy. I love how amazing it feels and how beautiful it looks together. The blush is this beautiful bright pink, its perfect for summer, to give that lovely pink flush to your face. The bronzer is a matte, dark brown shade that works well for warming up the face and can be use to contour as well. The highlighter slash setting powder, works well with any foundation, or concealer. This powder helps with setting the under eyes, in a great way. It brightens the under eyes well. Now with every product on here, i am going to include information from QVC or It cosmetics. com on these products, because I believe this information has help me and can help others. All of the information is in quotations marks. Now on to this great info from QVC, "What is it: Your perfect lighting and complexion perfection in a palette! With antiaging ingredients, this is one IT Cosmetics palette with three different complexion-enhancing, hydrating powders formulated to help give the appearance of even, bright skin and add a youthful-looking warmth to your skin. CC+ Brightening All Over Finishing Powder helps to blur the appearance of skin imperfections. CC+ Matte Brightening Blush adds the look of light and vitality into your skin with an easy-to-blend powder blush stain. CC+ Matte Bronzer adds sun-kissed warmth and glow to your skin without shimmer or glitter. Who is it for: Everyone who wants one palette to help brighten and add warmth to their beauty routine and to help reduce the appearance of skin imperfections. Everyone who wants to help hydrate and address skin concerns while wearing natural-looking makeup. Why is it different: It's infused with antiaging peptides; niacin; hyaluronic acid; hydrolyzed collagen; algae; vitamins A, B, C, and E; and Drops of Light technology without becoming cakey or creasing throughout the day. The CC+ Color pigments are infused into each powder, evening the appearance of skin tones and applying color that not only brightens and warms the skin but also helps to blur the appearance of skin imperfections. How do I use it: Dust the finishing powder all over for an instant brightening to your skin, plus color for the look of even tone. Next, sweep the bronzer across your forehead, under the cheekbones, along the jawline, and down your neck for the perfect touch of warmth and color. Finish with the blush by smiling and then gently blending onto the apples of your cheeks."" Now I am going to post swatches below of this palette. As always thank you for taking the time to read my blog. I hope you found this blog helpful, also saw my love for all three of these items. I always find new It cosmetics items to add to my shopping list everyday, thats how much i love this company. They are amazing, safe, healthy, cruelty free, and vegan. They help keep the skin glowing, and feel like creamy powder. I love love this brand and I hope you will too. I, encourage you to take a chance and try this brand, if you haven't yet, they are so worth there value. Now I am off to dream about more It cosmetics items, you all can find me on social media or at my email listed below.